Thanks a lot! I clearly remember that cassette too. Wasn't it from the same store where you bought two records from the EAP box set? Expert in Gallerian, Stockholm? 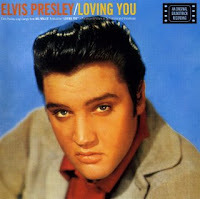 When I'm home again on Sunday night I will definately listen to that Loving you again. And maybe some other stuff too, eh? Yeah, it was the same store. I also remember bying "How Great Thou Art" and "Paradise, Hawaiian Style" (on cassette) there, as well. Ahh, those were the days! Good memories, i first listened alternate versions of the album in Essential vol 1. in 1989. It was a present from my mother from a trip she did to the USA (I'm from Chile but now i'm in Asutralia for a while). I couldn't find the cassete in that time, (i'm 29 and started folowing Elvis in 1986 i think). I remember i had a magazine with all elvis discography listed but i just had the cassetes edited in chile which where just a few. It was in the 90's when the local store started to bring elvis imported cassetes the black ones. I have just ordered the last version of the cd after reading this post..... Great Blog!